We live on a beautiful planet. There is so much love and beauty. But the powers that rule it, the governments and the elite, just don’t seem to want to do what’s right. Mother Earth produces enough to let at least 10 billion people live in peace and abundance, but all our rulers can think of is how to keep their power, create conflics and war, and make us pay more and more. Through dark brotherhoods and secret operations they ignore the will of the people. They try to keep us in a state of dependence and fear through the media that they control. Now, there have been many group visualizations and meditations already. For World Peace, for instance. Still, there’s no peace. Didn’t these actions work? They sure did! You could see it in our video. The problem is, that once the peaceful energy has done its job, if meanwhile the ruling powers keep working in the opposite direction, everything reverts back to the old situation again. Soldiers are ordered to pick up the weapons again that they laid down, crime rises again due to the difficult situation that people are still in, etc. That’s why we need to focus on something that cannot be reversed. Never. And that is: a BREAKTHROUGH. Don’t worry about exactly what you focus on, energy is an intelligent thing, it will find its way. As you could see in our video, when people visualize peace, also crimes against people decline, traffic accidents decline, emergency hospital room visits decline, and stock market soar. Peace is peace, a breakthrough is a breakthrough. Energy knows where to go. If we focus on a breakthrough, it will find the weakest link in the chain that still holds this worn out paradigm together. And it will BREAK it. When enough people visualize it, and truly feel it in their hearts, it will happen. It might be the 6,578th participant who gives the old paradigm its final little push, or it might be the 10,234th, but break it shall. Just wait and see. What’s most important, is the joy that you would feel if this breakthrough had just happened. Visualize, for instance, war and hunger making way for peace and abundance, all around our planet. Desperate children getting new hope. Stress and fear making way for happiness and time with your loved ones. Corrupt politicians and ineffective medical care making way for inspirational leaders and true healing. Toxic food and oil based industry making way for healthy food and free energy. All these things ALREADY EXIST on our planet, but are still being oppressed by the dark system. That’s why we need a breakthrough. And we’re gonna make it happen! We’re not going to name a time and date for all of us to do it, we ask you to do it NOW. It’s not important how long you do it, 5 seconds is enough. The important thing is that you truly feel the joy of this breakthrough, as it if had already happened. That’s enough to add your own little (but BIG!) contribution to the quantum ways through which the Law of Attraction works. 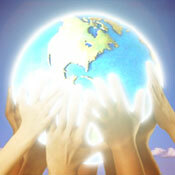 Together we make it a HUGE power that will change this world forever, for the good of the people. Please go ahead, you only need to do it once. Stop what you’re doing (probably reading) and close your eyes. Imagine that there is Breaking News about something that you’ve been wanting to happen for so long, and feel the joy that you would feel at that moment. Visualize it………..RIGHT NOW!!!!! That’s it! Did you enjoy that? Our collective consciousness just took your vote. Thank you. Your contribution was added to a huge wave of paradigm shifting energy that is already sweeping over the planet. The law of attraction will make sure that it comes into being. If you have done your visualization, now comes the second important part. This project works through the ‘everybody knows everybody’ principle. It is said that within six times of forwarding, you can reach every single person on the planet. So, we ask you to forward this email to EVERYBODY in your address book that you think would like to join this action. By doing this, we can create an enormous army of light, even in one day! Thank you so much for joining this action. Mother Earth and all of us who are longing for peace and harmony just like you, will be thankful to you. And to everybody else who joined, because we are doing this TOGETHER! Please forward this e-mail now. Don’t postpone it, NOW is the moment. PS After the paradigm has shifted, we can use or collective power for other causes. Like cleaning our planet, helping people in need, etc. if you would like to join these actions too, please leave your name at the bottom of our site VisualizeDaily.com. We also invite you to gather in your communities at 12:00 Noon in your time zone to create a wave of peace moving across our planet. Send us your photos of how you choose to #bethepeace to Unify’s facebook page, or share with the hashtag #bethepeace on social media. Organizing an event for the first time? go to http://www.bethepeace.com to receive an organizer package. Time has come for us on the surface of the planet to reach for the ultimate degree of unity and cooperation to assist the planet in its healing and transformation. Therefore, the Light forces are issuing a call to all meditation groups on the planet to join together, in synchronicity, for creating a powerful field of positive energy. The time for the Planetary Meditation has been set to 3pm GMT every Sunday. Currently, this is 11pm in Taiwan, 6pm in Cairo, 5pm in Central Europe, 4pm in UK, 11am in New York, 10am in Houston, 9am in Denver and 8am in Los Angeles. To create the most coherent resonance field, it is important for everyone to meditate at the appointed time, doing your own meditation as you feel guided. The critical mass for this meditation to have its desired effect is approximately 118,000 people worldwide in unified focus. If we consider that human concentration and meditation skills are not perfect, 144,000 people will assure the critical mass. You are welcome to share, invite and help by making this event go viral so we reach millions of people and the critical mass necessary will be attained.